Andrew Simpson Foundation Official Charity at Lendy Cowes Week. The Andrew Simpson Foundation (ASF) is delighted to announce that Cowes Week title sponsors- Lendy – has generously agreed to support the ASF Discover Sailing programme, being run daily throughout Lendy Cowes Week. Sign-up for ASF Discover Sailing- supported by Lendy, is at the ASF Stand on Cowes Parade and all-comers aged between 8-14 years old will be able to experience a free one-hour taster session. They can have a go at sailing, safely, under instructor supervision. The charity is striving to break down barriers such as a lack of finance, physical or learning disabilities, mental health or social barriers, and believes the sport promotes health and well-being, self-confidence and teamwork. In its capacity as the official charity at this year’s regatta, the ASF is setting out to demonstrate just what a difference it can make to the lives of young people across a whole range of charitable activities that the charity is delivering. Over recent weeks, the Foundation (ASF) has gained insight into the objectives, practices and attributes of Cowes Week’s new title sponsor, which in many ways mirror their own. The America’s Cup Artemis Racing Team Manager and Tactician Iain Percy will be in town on Charity Day ( 31st. July) in his capacity as a Founding Trustee of the Andrew Simpson Foundation. 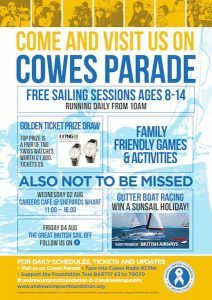 He will be helping out on the Cowes Parade Stand to promote Discover Sailing – supported by Lendy- as well as hoping to add his name to the Sunsail Gutterboat Racing leaderboard. 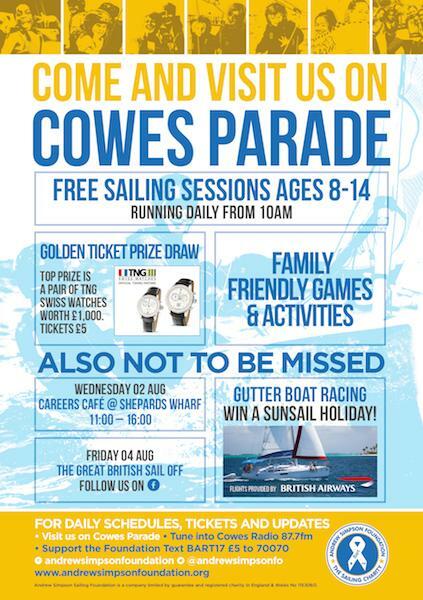 On Wednesday 2 nd August, supporters already signed up to impart their knowledge, opportunities and expertise to any young person wishing to visit the ASF Careers Café on Youth Day at Shepard’s Wharf, include chronyko, the Royal Navy, MDL Marinas, the RYS/IOW Foundation and Cowes Harbour Commission.